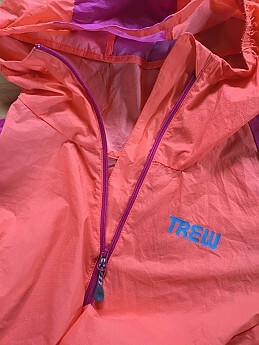 The Trew women’s Up Jacket (W’s Up Jacket…haha) has served me well as a summer weight windshirt. Lightweight, packable, and windproof, the Up Jacket is an excellent summit layer that is virtually unnoticeable in my pack. It's ideal for those who enjoy ultralight gear as it omits unnecessary features, saving on weight. It may not be a match for those on the market for a lightweight jacket with all the bells and whistles, but for me it has been an outdoor adventuring staple I’ve rarely left at home over the past few months. 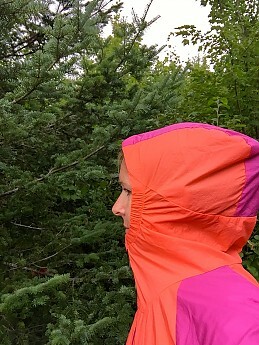 I tested the Trew women’s Up Jacket as a member of the Trailspace Review Corps in and around the White Mountains of New Hampshire from mid-June through August of 2016. I wore the jacket in temperatures ranging from 50 to 80 degrees Fahrenheit. 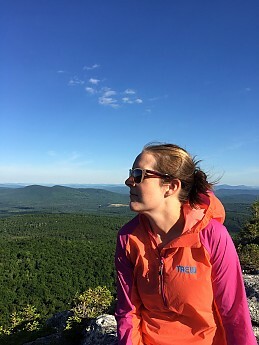 The Up Jacket accompanied me hiking, mountain biking, and boating on a lake in Maine. 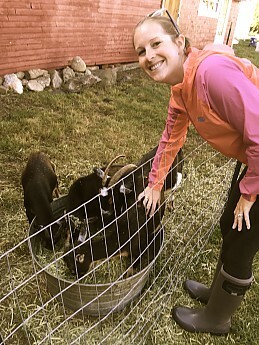 Recently, I even wore it while doing morning chores on a farm while the farmers enjoyed a well-deserved vacation! 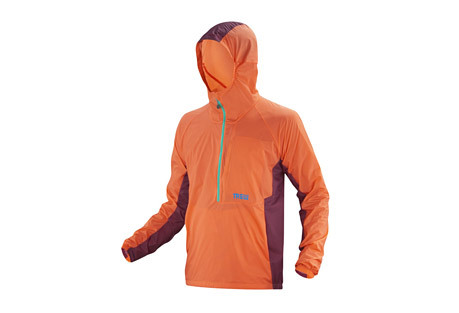 The UP Jacket is a windshirt made of flexible, rip-stop nylon. It’s a summer weight shell that has served me best on brisk mornings or windy summits when a lightweight, packable layer is all I need to take off the chill. 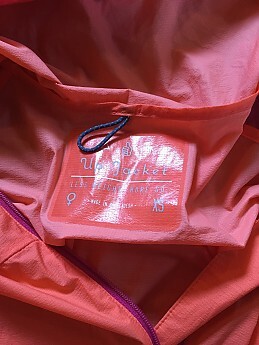 The single layer nylon shell has withstood a great deal of activity across a variety of sports for the past two and a half months and shows no obvious signs of wear. The fabric has not torn, the elastic has not stretched out, and the seams remain in tact. I’m 5'4" and tend to wear either a small or extra small top depending upon the cut. I have a short, narrow torso (35" hip, 27" waist, 33" chest, 15.5" torso length) compared to the length of my arms. Jackets designed to fit a petite torso don’t always offer enough length in the arms, which means I often have to choose between a jacket that fits my torso but is slightly short in the arms, or go up a size to a jacket that is a bit too long or big in the torso but gives me the arm length I need. When it comes to Trew’s Up Jacket, the extra small fits perfectly. I initially ordered the small thinking I’d need the length in the arms and that a more relaxed fit in the torso would give me some extra mobility and space for layering. 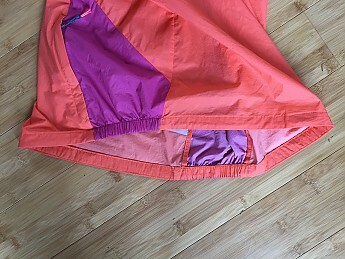 However, I found that the elastic waist wasn’t tight enough for me in the size small as air came in through the bottom of the jacket during strong winds (there are no drawcords at the waist, just elastic sewn into the hem). I haven’t had this issue since switching to the extra small. Despite going down a size, I haven’t encountered any restriction in movement and have plenty of length in the arms. Like the hem of the Up Jacket, the hood incorporates elastic sewn into the seam rather than drawcords. 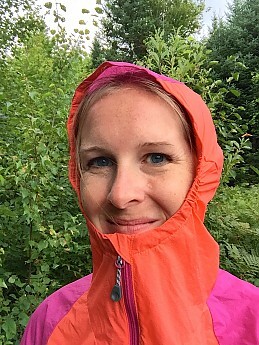 I was concerned that for this reason it wouldn’t offer the right fit in the wind, but was pleasantly surprised to find that the turtle-style hood fit snugly around my head without significant gapping or pinching. It provides enough length so the jacket doesn’t ride up when the hood is up, sheltering my torso and head on windy summits. The zipper is lined to prevent snagging on clothes or skin, and the nylon “garage” at the top of the zipper creates a soft barrier between the zipper and my face when the jacket is fully zipped. Trew appears to have sacrificed some adjustability in order to reduce the weight of the Up Jacket. As mentioned above, there are no drawcords, which means those intent upon really cinching up the cuffs, hood, or torso of the jacket will be at a loss. However, there is elastic sewn into these three hems, which I found to be sufficient in blocking the wind. The Up Jacket is made of flexible nylon and treated with a durable water-repellant (DWR) coating. 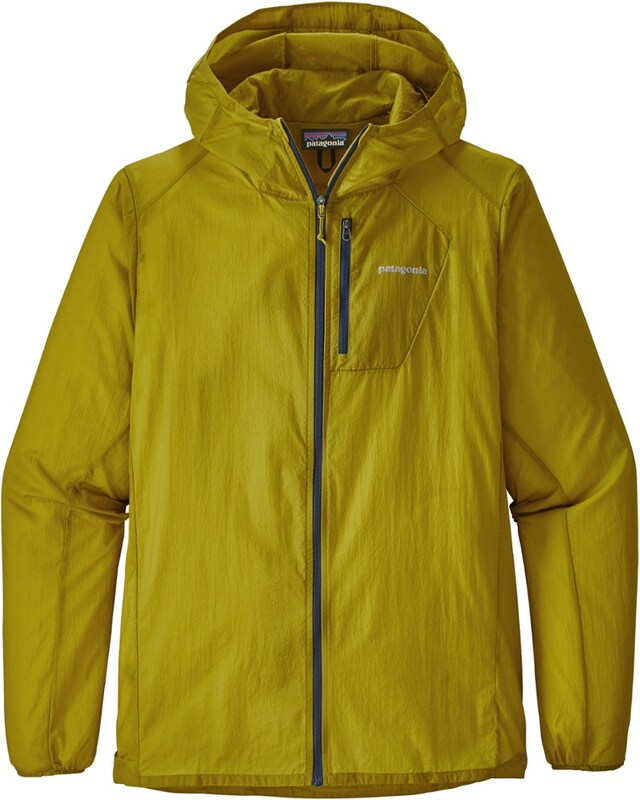 It will inevitably fall short of a waterproof shell, but does offer protection during light rain and fog or mist as moisture beads up on the surface of the jacket and sheds rather than seeping in. 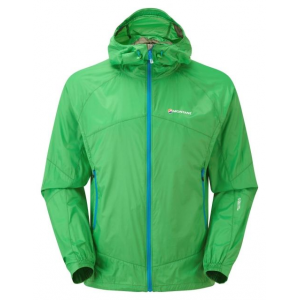 Trew’s description of the Up Jacket boasts a breathable PU coating, which lines the nylon shell. According to Trew’s website, “the coating is air-permeable, allowing your body's vapor to escape freely, while providing a windproof barrier on the exterior of the woven fabric.” The material is quite breathable for a shell and does seem to wick moisture. The one exception is the label, which, as you can see in the picture below, is fairly large and seems to incorporate a plastic-like coating. If I wear a t-shirt or racerback style tank I don’t even notice it. However, if wearing a tank top or open back shirt, the label, which is not at all breathable, tends to stick to my skin. Given that I’m most likely to wear the Up Jacket during summer months, the odds that I’ll be wearing it over only a tank top are fairly high. 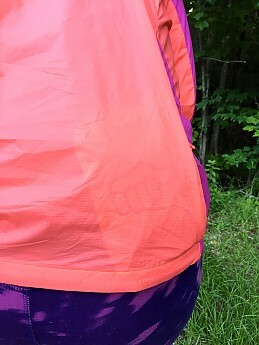 This issue with the label is relatively minor but is a bit of a pet peeve for me in that the label serves no function in the performance of the jacket and detracts from an otherwise highly breathable and comfortable summer layer. In addition to the breathability of the material itself, unzipping the half-zipper provides extra breathability, and the elastic cuffs can be comfortably pulled up to just below my elbows. I’ve found the Up Jacket to keep me adequately warm in windy conditions during the summer months. 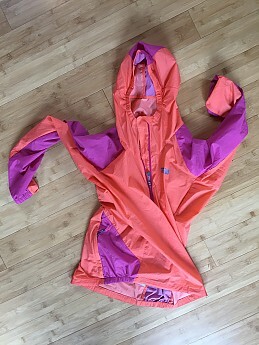 The Up Jacket is a windshirt. As such, it is not designed to provide significant insulation, but offers protection from wind and rain when hiking or doing other outdoor activities during the warmer seasons. 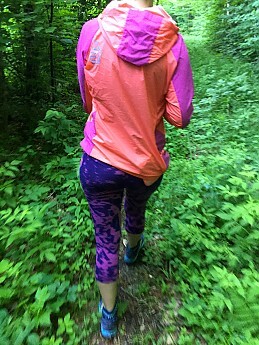 I also plan to wear the Up Jacket into the fall when a long-sleeve baselayer and a lightweight, windproof shell is all I need to stay toasty. The Up Jacket layers easily over a tank or t-shirt and a long-sleeve shirt. In terms of space, I can certainly get away with wearing these two layers underneath it. However, during the summer, I haven’t felt the need to wear more than a short-sleeve shirt underneath. Come fall, the Up Jacket will layer well under a down vest on days when a little more insulation would be helpful but there isn’t yet the need for a down jacket. When I think about abrasion, I consider how well the material of the jacket itself stands up over time and also whether or not it irritates my skin. 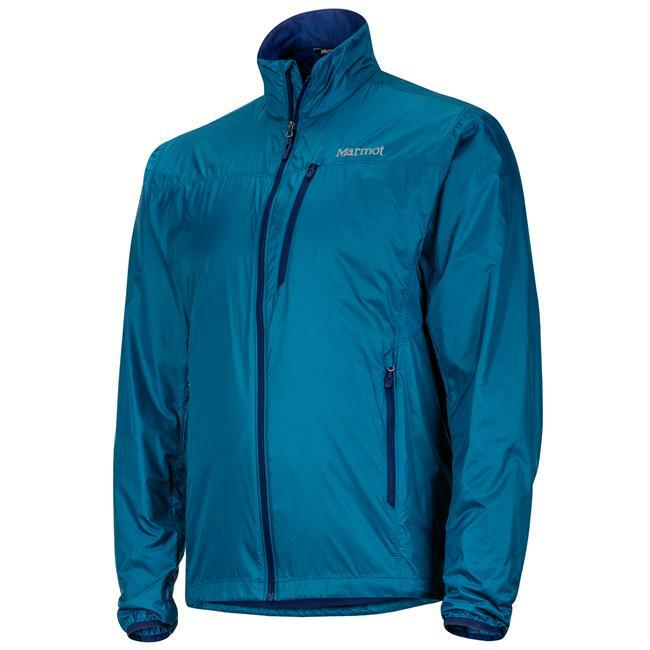 The Up Jacket shows no signs of pilling or wear over the past few months of use. I’ve worn it under packs while hiking and mountain biking and the usual locations where straps tend to wear at outer layers have held up just fine. 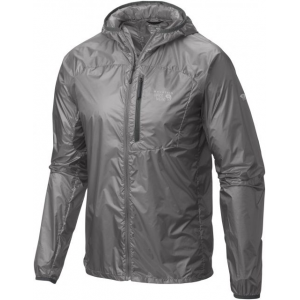 One feature I love about the Up Jacket is the flexible nylon material. Not only does the extra stretch offer ease of movement, but it also seems to add an element of softness, which makes my skin happy! I’ve often worn the Up Jacket over just a tank or t-shirt and haven’t experienced any chafing or skin irritation. The Up Jacket does seem to have sacrificed some features, likely in the name of lightweight, minimalist construction. There are no front pockets. The zipper is not full length. As previously mentioned, the hood and bottom hem of the jacket are lined with elastic rather than incorporating drawcords. Personally, I find that overall I appreciate the simplicity of this design. I don’t know the exact weight of the jacket (Trew doesn’t seem to list it online and I don’t have access to a scale that would offer a precise weight), however I can tell you that it weighs almost nothing and takes up minimal space in my pack. 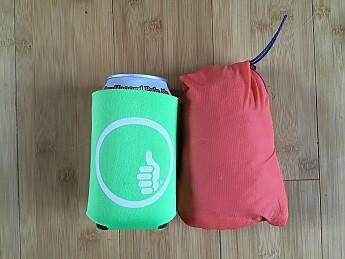 The description on the Trew website claims the Up Jacket “packs up to the size of a beer can.” In the name of gear testing, I investigated this claim and found that in fact the Up Jacket is the same size as a can of beer when compressed into the rear pocket, which conveniently doubles as a stuff sack. 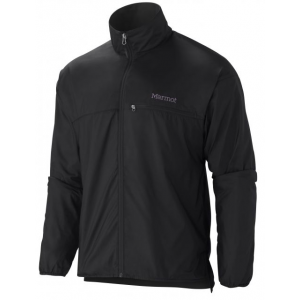 The Up Jacket has only one pocket, which is located on the back rather than the front. It’s large enough to hold an iPhone and a car key. However, the jacket is so lightweight that something as heavy as an iPhone tends to pull it down in the back. Contents lighter in weight, such as a trail map, are a better use of the pocket. Personally, I wish the pocket was on the front of the jacket for ease of use. For example, when wearing a pack, the pocket is essentially inaccessible. When not wearing a pack, I'm able to reach into the pocket to stow or retrieve items without too much trouble. However, it would be easier to do so if the pocket were in front. 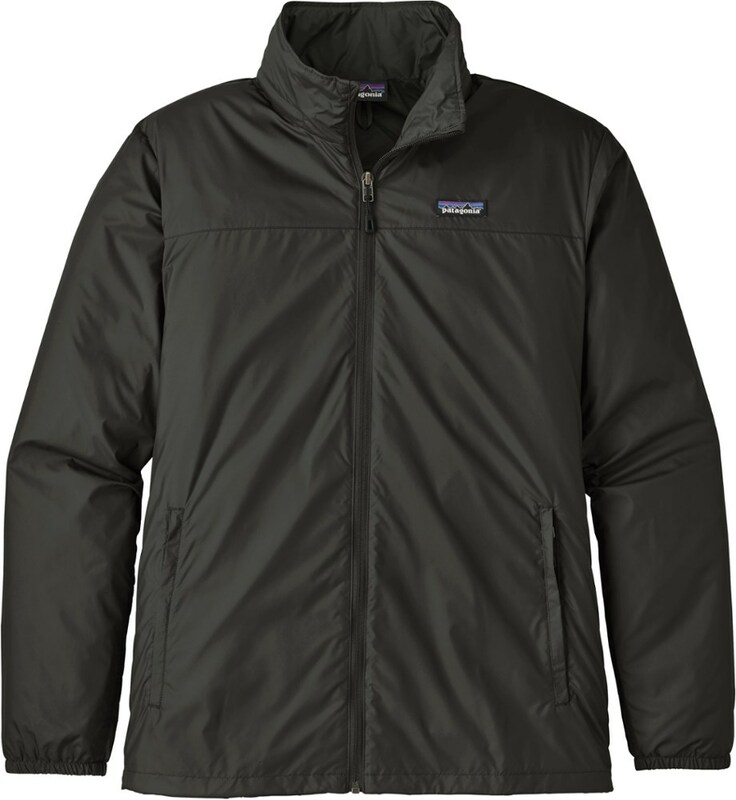 Retailing at $119, the Up Jacket is comparable to other windshirts on the market. Given the quality of the jacket, I find it lives up to its price tag. 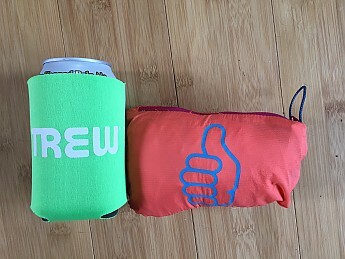 As a bonus, when I received the Up Jacket in the mail it was accompanied by a sticker, a patch, and a drink koozie…who doesn’t love outdoor swag!?! 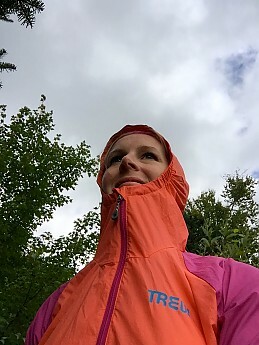 I’ve thoroughly enjoyed the opportunity to test the Trew Up Jacket. Whether heading out for a pre- or post-work hike, a full day hiking excursion, mountain biking, or boating, I found it to be an essential summer shell. Thanks to Trailspace and Trew for this testing opportunity! 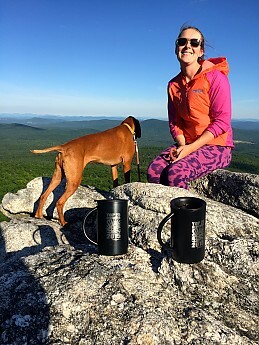 Trew Up Jacket...and Trailspace coffee mugs!! Excellent review, Kelly! Thanks for testing this wind shirt out so thoroughly all summer long. I'm glad to hear it worked out so well for you. 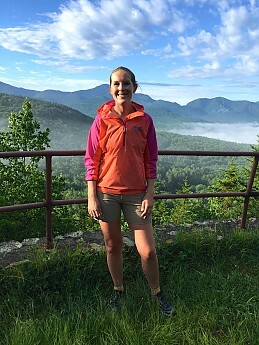 Welcome to Trailspace, Shay! We're glad to hear you appreciated Kelly's thorough testing and review. However, to retain the independence and credibility of our Review Corps reviews, neither we nor our testers can accept compensation for reviews. We're glad you enjoyed this one though! Great review, Kelly! I just saw this :) It looks really awesome. I've never heard of Trew, so I'm going to go look them up right now. The Trew Up Jacket is not available from the stores we monitor. It was last seen April 7, 2019	at LeftLane Sports.